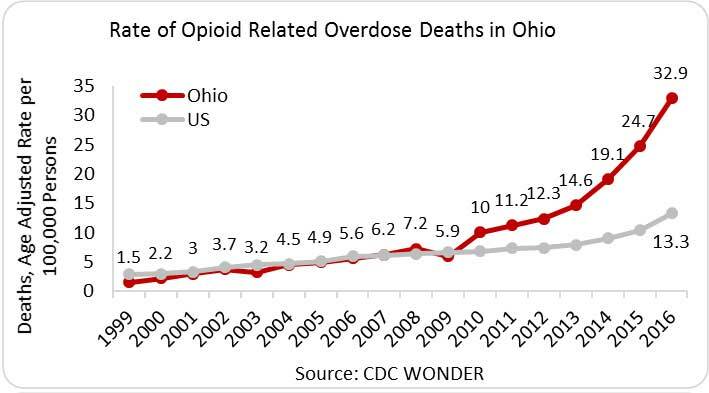 Ohio is among the top five states with the highest rates of opioid-related overdose deaths. 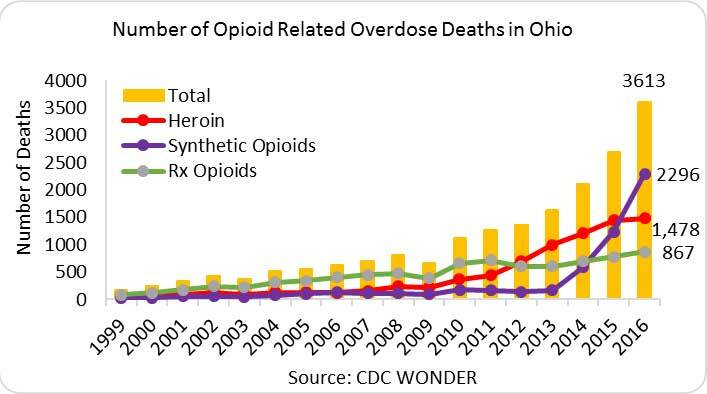 In 2016, there were 3,613 opioid-related overdose deaths­­­ in Ohio—a rate of 32.9 deaths per 100,000 persons and more than double the national rate of 13.3 deaths per 100,000. Since 2010, the rate has tripled from 10 deaths per 100,000. 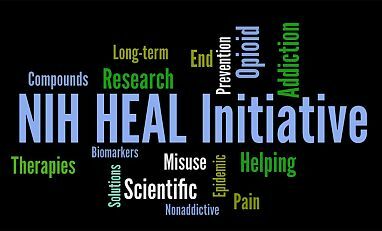 In the same period, the number of heroin-related deaths increased from 355 to 1,478 deaths, and deaths related to synthetic opioids rose from 175 to 2,296 deaths. In 2015, Ohio providers wrote 85.8 opioid prescriptions per 100 persons (9.96 million prescriptions). In the same year, the average U.S. rate was 70 opioid prescriptions per 100 persons (IMS Health, 2016). The incidence of NAS increased from 20 cases per 10,000 live births in 2006 to 155 cases per 10,000 live births in 2015—an almost eightfold increase (Ohio DOH). The national average across 28 states included in a separate 2013 analysis was 6.0 cases per 1,000 births (CDC, MMWR, 2014). State Incidence: Of the new HIV cases in 2015, 927 occurred in Ohio, with 5.9 percent1 of new cases in males and 14.8 percent of new cases in females attributed to IDU (AIDSVu). State Prevalence: In 2014, an estimated 19,911 persons were living with a diagnosed HIV infection in Ohio—a rate of 205 infections per 100,000 persons. Of these, 11.4 percent1 of males and 16.7 percent of females were living with HIV attributed to IDU (AIDSVu). State Incidence: In 2015, there were 122 acute HCV cases and 19,165 chronic HCV cases (with rates of 1.1 cases per 100,000 persons and 165.1 cases per 100,000 persons, respectively) (CDC). State Prevalence: As of 2010, an estimated 119,000 persons were living with HCV in Ohio (HepVu).